Boost energy & Blast-away Fat with this Total Gym Beginner Workout. 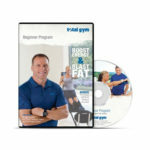 This program is designed to jump-start your fitness program and increase your strength, stamina and energy. This program WILL get you stronger, it WILL get you in better shape and it WILL increase your metabolism so that you can blast away fat…even when you’re not exercising. Beginner does not mean easy – it means learning the basic moves and perfecting them.